Preliminary note 1: these macros will ripple measures from one system to another system for single staves only (for instrumental parts, this would almost always be sufficient). 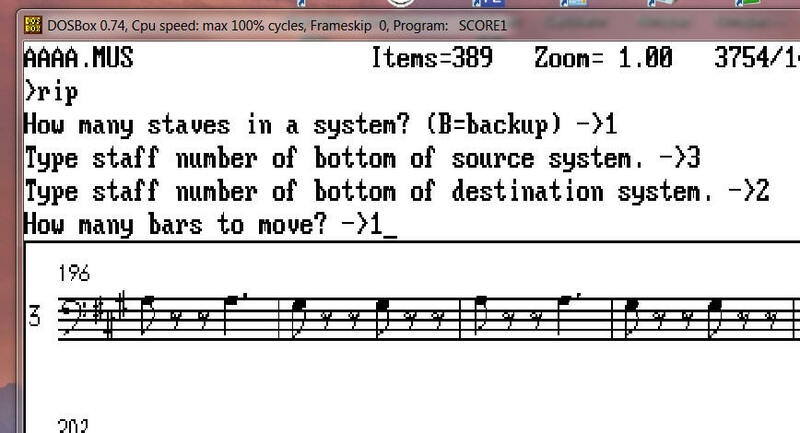 If you wish to ripple measures from multiple staves at once, you’d have to invoke the standard SCORE commands for that. Of course, ultimately, it is hoped that on ScorBox.com we’ll be able to post additional macros (mere variations on those available on this page) to address that need. You are invited to submit such macros for posting and download. Preliminary note 2: please note that all of these macros attempt, as part of their SCORE command syntax, to modify measure numbers as required. This will work only if measure numbers have been assigned as code 10 elements, and if their p3 values fall between -3 and +3 (look inside the macros for specifics). If that is not the case in your files, then measure numbers will not be modified. And in the case of instrumental parts, block rests on the source and target staves may require additional measure number modifications. If the results are unacceptable, or you made an error, click “Undo,” and the file as it was before the operation is instantly restored. Rippling measures upward to the preceding system functions similarly. 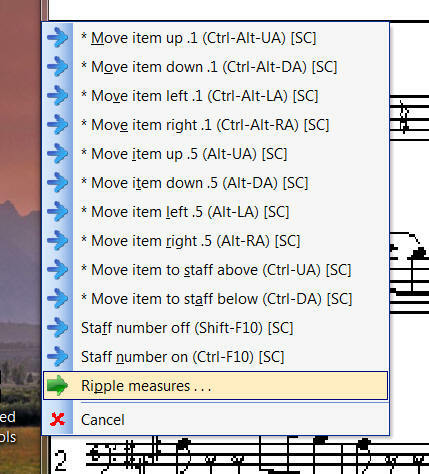 Invoke macro “Ripple measure(s) up” (for instance, by invoking hotkey Ctrl+=) and simply follow the two prompts. 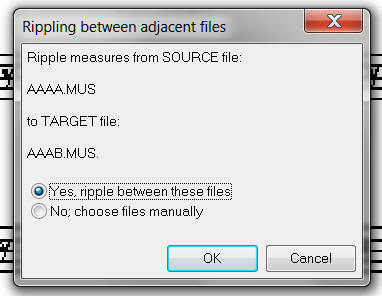 This first prompt indicates to you between which files the measure(s) would be rippled. 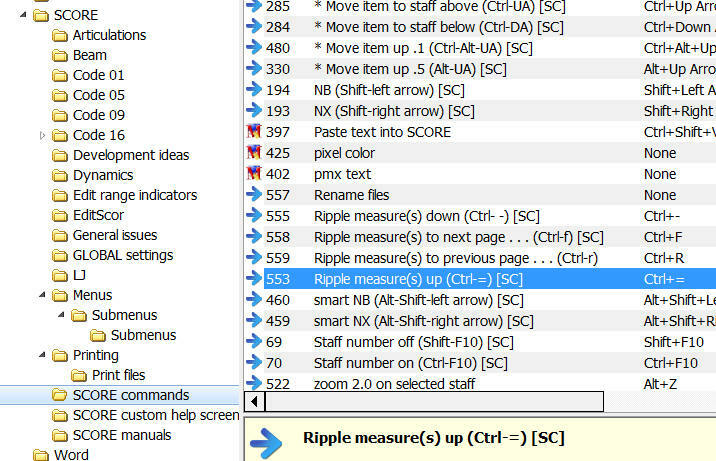 It is assumed that you would wish to ripple measures from a currently open file to the adjacent file (in this case, the subsequent file). 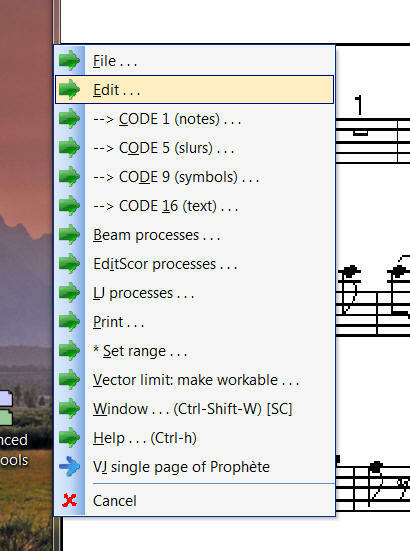 Thus, you don’t need to memorize, or note, which two files you need to edit, as the macro keeps track of that for you. If the files indicated by the macro, for some reason, are not the files between which you wish to ripple measures, you can choose the files manually (as indicated by the prompt), or perhaps abort the macro, load the source file, and then invoke the macro again. Here, simply indicate the target staff. Note that, as part of this macro, the target file has been called up, and the display moved to the top of the page so as to make it as easy as possible to identify the target staff number for this prompt. Here, you have another chance to review your input. Here, you have the opportunity to review the results of the process. Move back and forth between the two files as often as you wish (keeping the prompt open). If you are satisfied with the result, click “Accept,” and the macro terminates. Otherwise, click “Undo,” and the original files are instantly restored.